This document describes how to install and use the tool supporting the results of the paper Structural Model Subtyping with OCL Constraints by Artur Boronat (University of Leicester, UK), accepted for publication at SLE@SPLASH’17. Our tool facilitates the reuse of model management operations that are defined for metamodel specifications, which consist of an EMF metamodel together with its well-formedness constraints (in OCL). Specifically, our tool infers whether two metamodel specifications, whose metamodels and constraints need not be related a priori, are compatible. This captures the notion of subtype polymorphism in model management operations using structural model subtyping with optional OCL constraints. Our tool implements the structural subtyping relationship in a type-theoretic framework with multiple inheritance semantics and can be used for implementing various use cases in flexible model-driven engineering, for example: structural (semantic) refinement, evolution of domain-specific modelling languages, and reuse of model management operations. To deal with structural subtyping, the tool synthesizes an extension metamodel that is employed both to check the compatibility of OCL constraints and to reuse model management operations without requiring manual intervention. The extension metamodel can be obtained both for single and multiple inheritance contexts. Moreover, the tool produces complements of the supertype and subtype metamodel, w.r.t. the chosen subtyping relation, which can be used for guiding the reuse model management operations. In addition, our structural subtyping mechanism is expressive enough so as to support variants of model subtyping, including multiple, partial, and dynamic model subtyping. Our tool is available as a Java library together with a self-contained Gradle project that includes all the dependencies required for using the tool together with additional resources implementing the examples of the paper. The tool has been tested on macOS 10.12.4 (Sierra) and Linux Ubuntu 15.04 (Vivid Vervet). In addition, a VirtualBox image with the Linux configuration is available for download. This document contains three main sections: an overview of the contents in the zipped file, an installation guide, and step-by-step instructions arranged in the form of specific scenarios for each of the use cases mentioned above. These step-by-step instructions illustrate the core contributions of the paper and show the full extent of the examples used in it. Moreover, these scenarios have been implemented in executable test cases in order to ensure the experimental reproducibility of the results of the paper. README_offline.md: offline version of the file README.md. The difference between these two files is that README.md is readable on GitHub and README_offline.md is pretty printed as .README_offline.md.html, which is readable in a browser offline - that is URL paths are accessible using file:/// in the browser. .README_offline.md.html: README_offline.md in HTML format. Images should be displayed correctly and there is no need to access any external resource unless the VirtualBox image is downloaded, in which case Google Drive will be accessed. 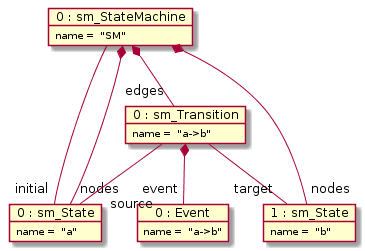 an scenario on state machine simulation illustrating how the tool provides support for dynamic model subtyping. subtyping.sm.atl: ATL transformation (evolution) - ATL project containing the transformation needed to test the evolution scenario. subtyping.sm.atl.simulation: ATL transformation (simulation) - ATL project containing the transformation needed to test the simulation scenario. The tool has been tested on macOS 10.12.4 (Sierra) and Linux Ubuntu 15.04 (Vivid Vervet). A VirtualBox image with Linux Ubuntu 15.04 is available, as explained below. From GitHub: clone the git repository: https://github.com/mde-subtyping/web.git. From the zipped file: you should have unzipped the file to get this README file already. Select the project folder subtyping.tests in your git repository. If prompted Overwrite existing Eclipse project descriptors?, choose Overwrite. Use the option Gradle wrapper. Import the ATL projects using Import > Import Existing Projects into Workspace. By default, the tool is configured to run the examples for macOS. Please check that the file src/test/resources/maude/maude.linux64 is executable, or else modify the corresponding access permissions using chmod. After that explore the test cases under src/test/groovy, which can be run as JUnit test cases. Follow the step-by-step instructions given below. A VirtualBox image with Linux Ubuntu 15.04 (Vivid Vervet) and Eclipse configured to run the test cases is available for download. Download the VirtualBox image Ubuntu 15.04_SLE17.ova from Google Drive. Import the appliance in VirtualBox. In VirtualBox, right click on image and Start > Normal Start. Use the following credentials (User/password): ubuntu/reverse. There is a direct link to Eclipse Oxygen on the desktop. Run Eclipse. Follow the step-by-step instructions given below. In the following subsections, we provide the examples used to illustrate the core contributions in the paper. The tool will determine whether (sMMPath,sOcl) denotes a model subtype of the model type denoted by (tMMPath,tOcl). This use case is illustrated in more detail below, in Scenario 1: Structural subtyping (Subtyping, Structural Refinement) and in Scenario 2: Structural subtyping with OCL constraints (Semantic Refinement, Multiple Typing). Note that any of the sets of OCL constraints may be empty (with the empty string ""). If tool.multipleInheritance = true when configuring the tool instance, subsequent `bindingX files represent the strict typing solutions by order of recommendation prioritizing those with a better coverage of subtype classifiers with supertype classifiers, as explained in the paper. For each strict subtyping solution X, the models described above are also synthesized. If the check fails, there are two main sources of incompatibilities: the model types denoted by the metamodels, and the OCL constraints. In the first case, the tool points at the source of the problem by showing the classes of the supertype metamodel tMMPath that are not extended by classes of sMMPath in the supertype complement bindingX_supertype_uncovered.ecore. That information is useful to assess the advantage of, for example, prunning the supertype metamodel by computing the effective metamodel w.r.t. a specific model management operation, as illustrated in Scenario 3: DSML evolution (Reuse, Partial Typing). In the second case, the tool will provide evidence that contradicts the compatibility property of sOcl w.r.t. tOcl in the form of a model conforming to the synthesized extension metamodel bindingX_virtual_mm.ecore, represented in EMF notation (that is in XMI format), that invalidates a constraint in tOcl. Note that the solver needs to be configured appropriately, in the configuration file as explained above, for increasing the likelihood of finding a problem if it exists. If the check succeeds, the tool guarantees that (sMMPath,sOcl) is a structural refinement of (tMMPath,tOcl). Hence, any EMF model management operation that is defined for (sMMPath,sOcl) can be safely applied to models of (tMMPath,tOcl). 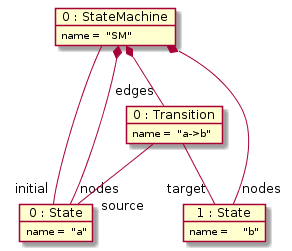 Going one step further, the tool also facilitates the reuse of such operation by automatically synthesizing an extension metamodel bindingX_reuse_mm.ecore that can be substituted for tMMPath in the signature of the operation ensuring its application to models conforming to (sMMPath,sOcl) without any further change. 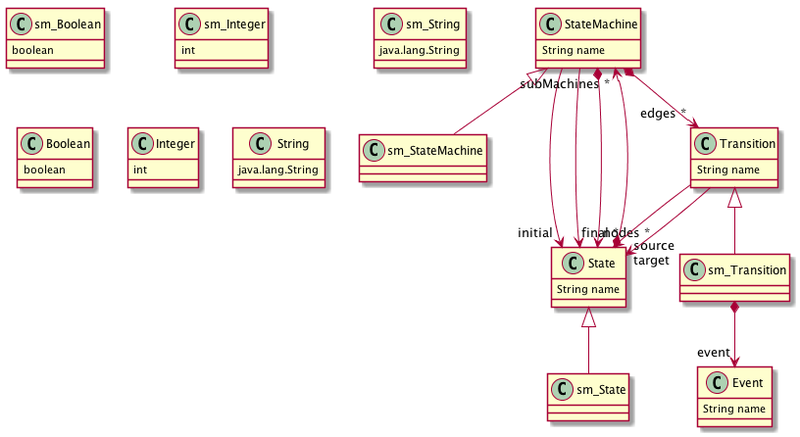 This use case is illustrated with two scenarios: Scenario 3: DSML evolution (Reuse, Partial Typing) and Scenario 4: Stepwise Simulation of Deterministic State Machines (Reuse, Dynamic Typing). The scenarios below illustrate specific examples that have been used to support the results in the paper. These scenarios have been implemented in test cases for ensuring the reproducibility of the results. Note: for inspecting the generated models using model editors in Eclipse, such as the EMF reflective editor or Exeed, the corresponding metamodel needs to be registered using Epsilon’s Register EPackages facility in advance. This option appears when right-clicking on a metamodel .ecore in Eclipse. The reason for this is that synthesized metamodels reuse information from the original metamodels and the EMF registry needs to be updated to fetch the corresponding metamodel when loading a model. where changes have been highlighted. These results are consistent with those presented in 1 but for the cases where many-bounded references in a supertype are constrained by a lower upper bound in the corresponding subtype. In our tool, those cases are valid. In this section, we use the main example of the paper for illustrating how multiple typings can be applied to a metamodel at the classifier level, that is, a class of the subtype metamodel can be typed by more than one class in the supertype metamodel. The generalization of multiple typing at the metamodel level, where several metamodels can be used as supertype of the same subtype metamodel, is supported by providing an extension metamodel for each different pair of metamodel specifications. However, as each such extension metamodel is linked to a different pair of metamodel specifications, with the intention of reusing a model management operation in a given context, we restrict ourselves to an example with one single model management operation. 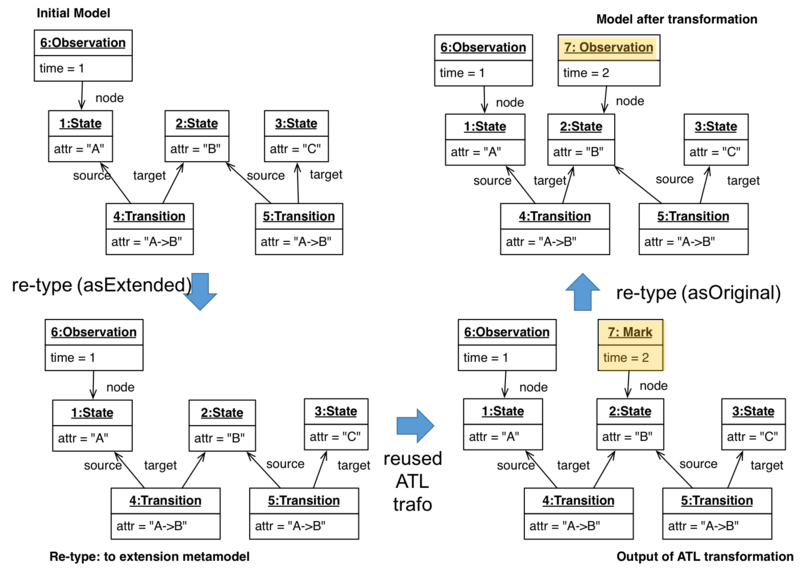 In the example, we are using the metamodel specifications depicted below for defining graphs (metamodel and OCL constraints) and deterministic state machines (metamodel and OCL constraints), resp. 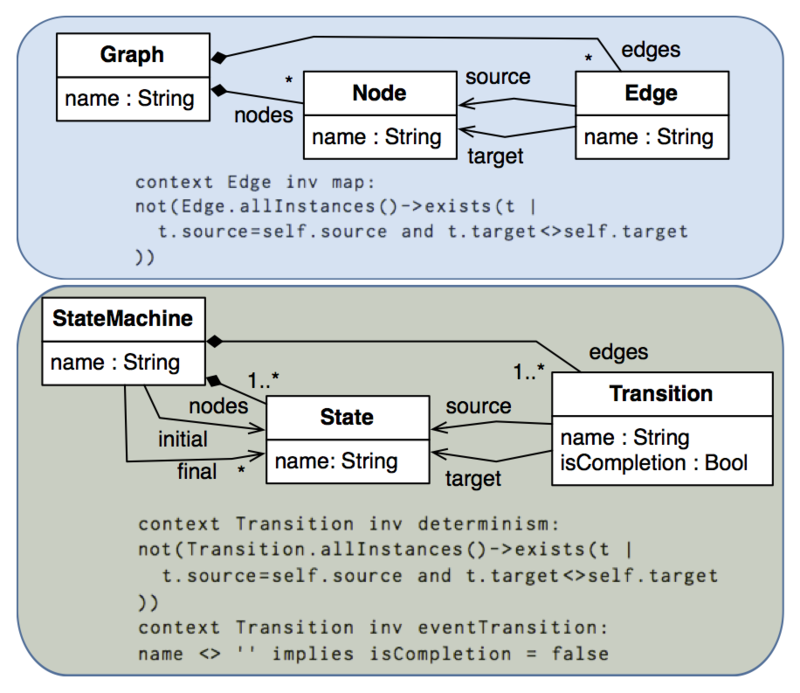 The model types described by both metamodels are structurally similar in that they both describe languages of graphs. 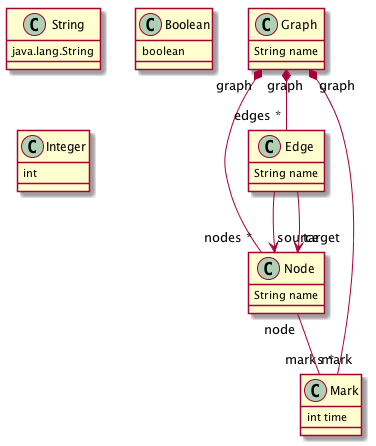 On the one hand, the top metamodel specification characterizes the graph of a function defined over nodes. 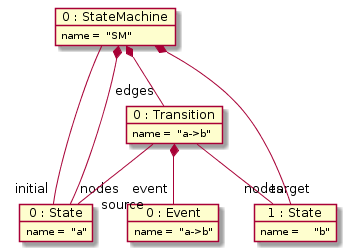 On the other hand, the bottom metamodel specification characterizes deterministic state machines where transitions can be triggered by an event (indicated in the name attribute of the transition) or are triggerless, e.g. they are completion transitions. The counterexample in generated in the folder temp/model, where temp is the temporary folder specified in the corresponding subtyping.properties file. The counterexample is a model conforming to the virtual metamodel and can be casted down to the subtype as explained in the sections below. These test cases demonstrate the usage of the possible combinations of OCL constraints with metamodels for checking structural subtyping, showing that OCL constraints are optional in metamodel specifications. 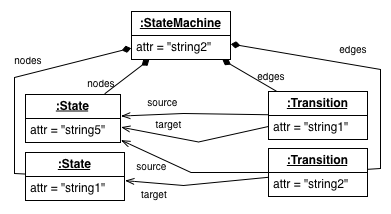 In this section, we are going to show how to reuse a model management operation - in this case, a model-to-text transformation with ATL - for a modified version of the state machine metamodel. In this scenario, we discuss how to use the tool to reuse an ATL model transformation defined for a metamodel version 1 for models of a metamodel version 2 when the metamodel version 1 is not exactly a supertype of the metamodel version 2. In addition, we illustrate that the ATL model transformation can be applied even if a model is only partially typed by the metamodel involved in the ATL transformation. The steps involved in this scenario relating to our tool are fully automated in the test case test_evolution_scenario. The steps that require interaction with ATL need to be carried out manually though. 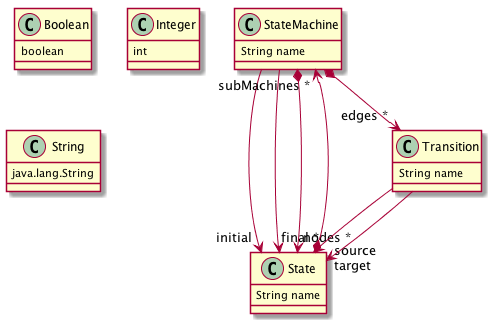 Can we reuse the model management operation for compiling state machines that conform to version 2 of the metamodel (as the one depicted above)? Our subtyping operation assists us in determining that version 2 of the metamodel together with the OCL constraint is a refinement of version 1 as shown in this test case, which is not due to the removal of the Observation concept. 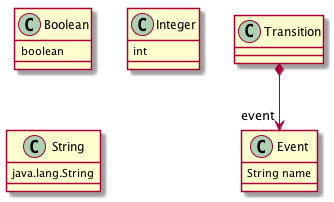 By looking at the generated binding file and at completement of the supertype metamodel (shown below), the modeller has information to find out the source of the problem. automatically by using tools like anATLyzer that perform static analysis of ATL transformations. The subtyping operation is used again to check whether the effective metamodel is a valid supertype for our metamodel (version 2), which is correct. and the complement of the supertype and subtype metamodels. 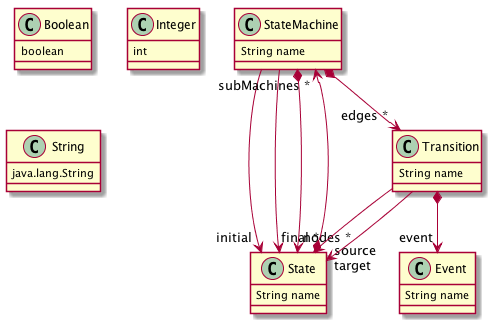 The complement of the subtype metamodel (shown below) tells us that the models of the subtype are only partially typed with the supertype metamodel, as the class Event is not covered. This model can be processed by the ATL transformation, after replacing the original metamodel with the synthesized extension metamodel. Note that the adaptation of the model is only mandatory when the set of class names in version 1 and the set of class names in version 2 are not disjoint. 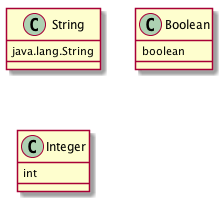 In case the renamings applied to the subtype metamodel in the extension model make the object type names different from those in the original subtype metamodel, the tool facilitates an adaptation from the extended metamodel to the original metamodel as explained in the following scenario. In this example, we are considering the reuse of an ATL transformation used in the paper for simulating deterministic state machines stepwise by using an ATL transformation that applies a function graph to a node. The difference with the evolution example is that the simulation example generates new elements in the transformation, which are automatically re-typed in our approach, illustrating how dynamic typing is supported. The steps in the scenario described below have been implemented in the test case test_simulation_scenario. The resources used in the scenario are reachable from the implementation of the test case. The ATL transformation, shown below, applies a marking to the nodes of the graph by following the order imposed by the edges of the function graph. 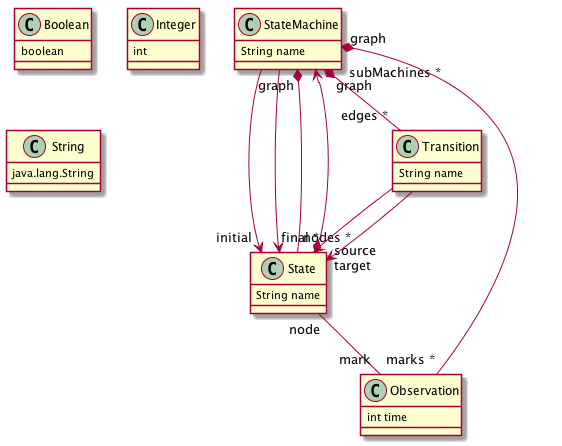 The execution of the ATL transformation simulates the application of the graph function to a node, when there is a successor node that has not been marked in the model. 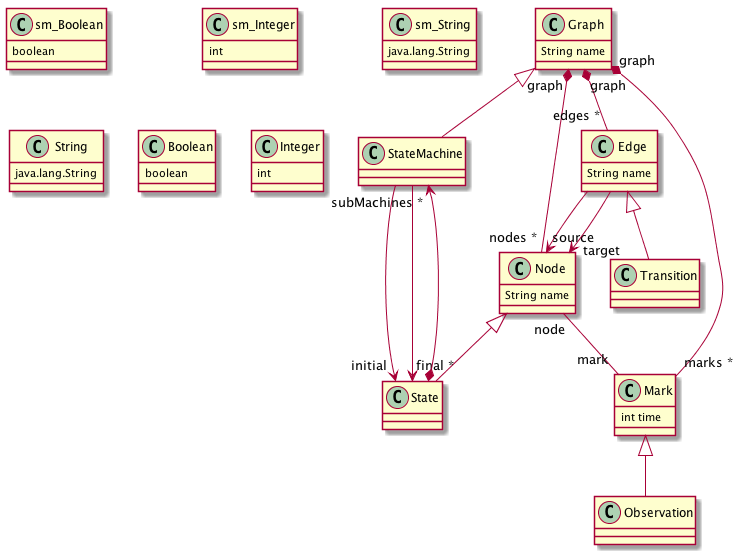 In these models, we have obliterated the root object Graph. 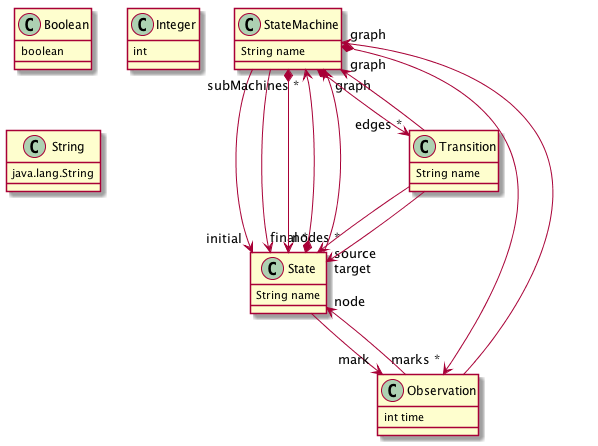 In addition, we can check that the complement of the supertype metamodel only contains datatypes, indicating that all the supertype classifiers are covered by the subtyping relation and, hence, that the metamodel graph is indeed a supertype of the deterministic state machine metamodel specification. 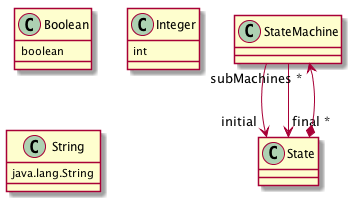 And that the complement of the subtype metamodel contains the references initial, final and subMachines between the classes State and StateMachine, indicating that the inferred subtyping is a partial typing. As discussed in the paper, the subtyping relation must be strict in order for the last re-typing to work automatically. TOTEM-MDE: for integrating the USE validator with EMF. USE validator to reason about OCL constraints. Maude4J: An Eclipse-independent version of Maude Development Tools for integrating Maude with Java.